All over the world, people devote their lives to the imitation of Elvis. Male and female, amateur and professional, in $1,000 costumes or homemade jumpsuits, they converge on the US every year to compete in regional heats leading up to the ultimate Elvis impersonators' competition - the Las Vegas-based "Images of Elvis." Paget's intimate documentary follows several hopefuls towards the 1999 competition, taking in their lives and the wider Elvis industry on the way. 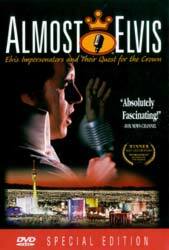 The filmmakers are perhaps a little too respectful of their subjects, avoiding hard questions; and if you really can't bear Elvis, this documentary is unlikely to change your mind. But, more enjoyable and more psychologically revealing than you might expect, this documentary is a great tribute to human eccentricity and the need to believe in something bigger and more glamorous than everyday life. A modest package of DVD extras includes stills, a look at the history of Elvis impersonators, and a fun Mystery Elvis feature - famous people dressed as Elvis. Almost Elvis is an unusual and fascinating evening's viewing.